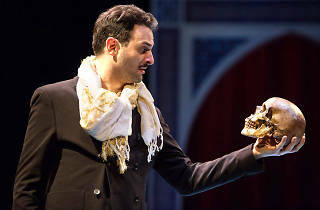 Hamlet the character and Hamlet the play can be such indecisive creatures. The first wavers in the midst of his own revenge plot; the second is a tangle of variant texts that invite dramaturgal tampering. In Waterwell’s version, radically edited and interpolated with Farsi translation, puzzlement seems to be the goal. We are accustomed to a Hamlet who explains himself, but this one turns us aside lightly, smiling at our confusion. Directed by Tom Ridgely and set in Persia in the early 20th century, the production is physically graceful. On a tiny, round, blue-tiled stage—Jason Simms designed the set—Hamlet (Arian Moayed), mother Gertrude (a restrained Sherie Rene Scott) and uncle Claudius (a marvelous Andrew Ramcharan Guilarte) negotiate their familiar tragedy. The textures throughout are lush. Iranian composer Mohsen Namjoo plays throbbing setar accompaniment; minor characters like Rosenkrantz (Arash Mokhtar) are exquisitely drawn; the conceit of a Westernizing, bilingual Persian court unfolds in surprising ways. When the Norwegian interloper Fortinbras (Cary Donaldson) enters dressed as a British desert corporal, we reconsider what’s really “rotten” here—and for how many more decades that rot will keep eating into the earth. The performances, including Micah Stock’s drawling Horatio and Barzin Akhavan’s vivid Player King, are mostly strong. 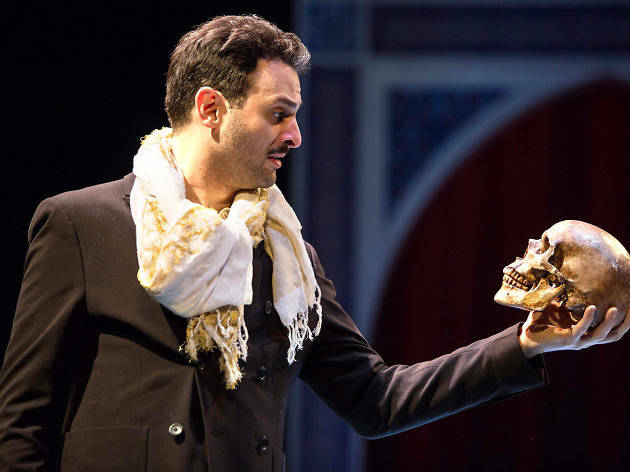 But Hamlet is the drama’s prime mover, and Moayed’s elegant diffidence alters the play’s gravity. He and Ridgely have created a script in which Shakespeare’s soliloquies wander (“To be or not to be” shows up near the end) or vanish completely; in each case, the edits shut our windows into Hamlet’s thinking. Moayed’s Dane blossoms as he plots; this Hamlet dances and shrugs and laughs his way to vengeance. We watch as Shakespeare’s most transparent character becomes opaque instead. If the play goes a little glassy, that’s a reflection of this new prince—sweet, but strange as well. Sheen Center (Off Broadway). By William Shakespeare. Directed by Tom Ridgely. With ensemble cast. Running time: 2hrs 50mins. One intermission. Through June 3.